Armed with a freshly installed LX-Nav 8080 flight computer, I drove off to Central Pennsylvania for my first contest. I really was unsure as to what to expect from this. Sure, I've done a lot of cross-country flying before, but have never tried to fly fast. Only fly far, and keep from landing in some random person's field. Sister ships, N483KS "QQ" and N484KS "KS"
The practice day was washed out by some serious rain. I spent the time pitching my tent. I've heard stories about tents being blown away on the ridge days. I've heard stories of porta-potties blowing away, too. To prevent my tent from blowing into an adjacent farmer's field, I placed the newly-purchased extra spare tire for my trailer in the tent. The Coleman tent had a perfect spot for it, too. The spare tire was still in its shipping box, so none of that nasty rubber stuff would rub off in my tent. On Monday, our first contest day got underway. I had to learn how to program a task into the flight computer. Reading the manual wasn't particularly helpful. Thankfully, Dave Weaver is an LX expert. He claims that he should be paid by LX as a service consultant, and that he's convinced many people to choose the LX over the ClearNav. Although there was no more rain, there was still a great deal of moisture in the atmosphere, and the morning didn't look like there was going to be any flying. A thick fog filled the Mifflin valley, and threatened operations on Monday. The fog burned off, and the cumulus clouds started forming at around 11:30. 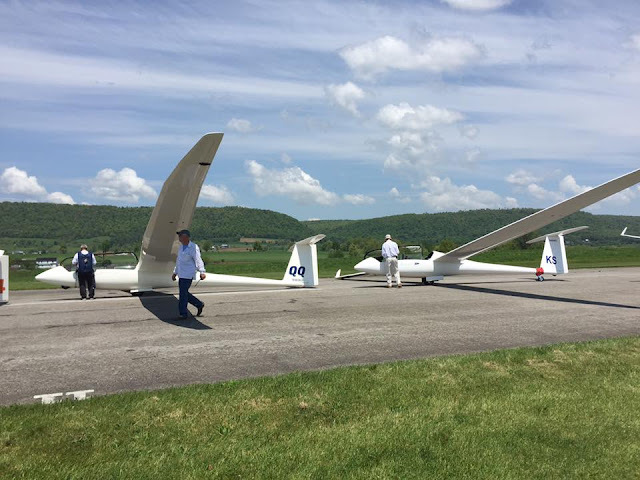 The gliders were told to go to the runway as early at 10:30, for a noon-ish launch. 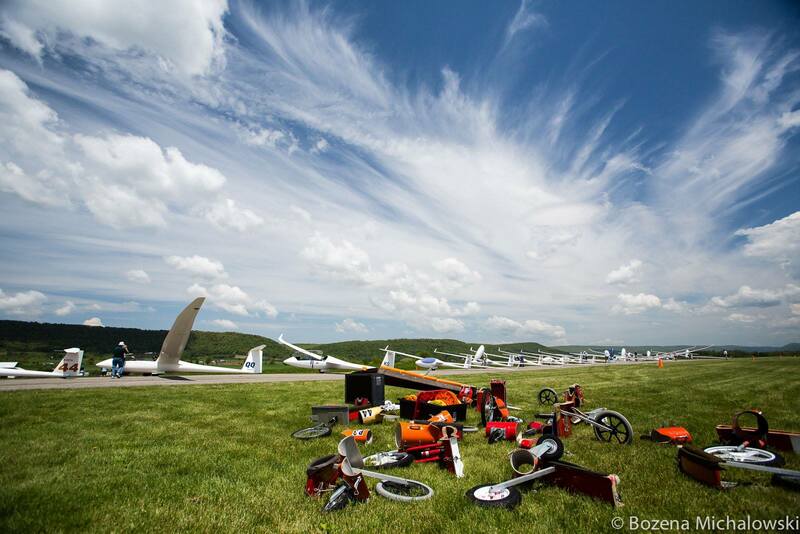 I was somewhere in the middle of the pack of gliders. Far enough back that I got to figure out how this contest launch thing works. There is no time to mess around. Once that tow plane lands, a ground crew runs over, picks up the rope, and within 10 seconds, you're hooked up. If you haven't finished your checklist by the time the rope comes taut, you're going to have a rough take-off. No rudder waggle, no "are you ready?" You're assumed to be ready if you do the hookup of the cable. Once airborne, and off tow, we quickly realized that something was wrong with the new flight computer. The variometer, while doing indications on the ground when breezes went by, was stuck at zero. The airspeed indicator on the V8 variometer was zero. The LX-8080 thought we were still on the ground, at the field elevation of 820 feet. That's no good. Thankfully, I had a backup variometer on board, but only had one unit in the front seat. The backup variometer had an audio tone, but it's really not very loud. The conditions were pretty marginal, to say the least. I got to the start height, and decided to start the task anyway, even if the flight computer isn't 100% operational. I exited the start cylinder. The flight computer refused to cooperate. "Dude, you're on the ground. It says right here, the field elevation is 820" It refused to start the task, no matter how many times I pressed the "Start" button. I was no longer able to fully concentrate on the task of flying into cloudy, rainy weather, with a new system, with a broken variometer, with a flight computer that was refusing to navigate. I whined, whimpered, and went back to the airport for a score of ZERO points for the day. I had a lot of time to think about how I might have messed up the tubes to the new unit, and while all of the other instruments continued to work properly, there were a few possibilities of oops that I made for the new system. The good news is that for that first day, many others also got zero points. The day was devalued, and the top competitor in the sports class, Karl Striedieck, got only 505 points instead of the regular 1000. So I picked a good day to get zero points. 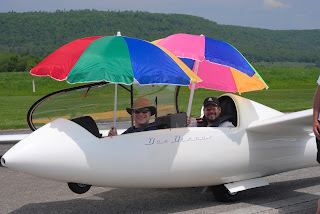 And I wasn't at this contest to be competitive, anyway; just to do some good cross country flying and have a good time. After landing, I opened up the instrument panel, figured out what I did wrong. I asked around for a spare piece of tubing, and connected the total pressure tube to the right place on the V8 variometer. After everything was in good working order, (or so I thought), I asked the contest director (CD) for a re-light. "I realize that it's unorthodox to ask for a re-light as people finishing the task, but I need a shake-out flight". The CD agreed, and a quick flight to 2000' showed a working variometer, and a flight computer that didn't insist that we were still on the ground. 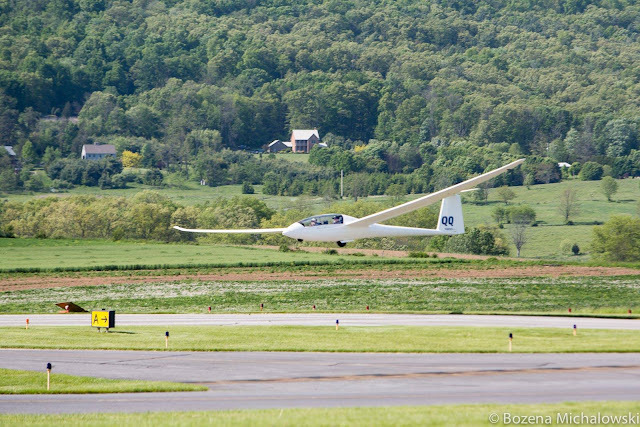 Tuesday was shaping up to be the best soaring day of the entire contest. Pete Maynard was the co pilot for the day, and did a great job of planning out everything on paper. We did what was a Gold Distance flight, covering most of the terrain around Mifflin. The final turnpoint was to the northwest, at a place called White Pines. The territory in this area was not ridge and valley, but more like eastern Kentucky. Lots of small hills, not many fields to land in, and a fracking pad every few miles. The thermals here were quite honest, taking us up to 10,500' at maximum. I had a lovely 45 mile final glide from this turnpoint back to Mifflin, with a nice tail wind along the way. Northwest of Williamsport, PA. Truly unlandable terrain as far as the eye can see. The blue squares are fracking pads. The humidity was starting to climb, but the soaring was still good. I took up Evan for the Day 3's flying. We had a 3.5 hour flight that had a good distance, but not as far as Tuesday's flying. Day 3's task was a MAT, a Modified Area Task. After the first four turnpoints, I got to make up my own turn points for extra distance. Unfortunately, the sports class was one of the last few classes to launch, and we didn't get a full day in. My last turnpoint at Sawmill was the last point that I saw any lift. I pretty much did a final glide for the last 20 minutes of the task, and landed 7 minutes before the minimum time on the task. Evan and Pete Maynard had left for home, and replacing them were Chris Carswell and Bill Bank. Chris Carswell got into the front seat, and we had an aggressive task called on what looked to be a marginal day. It took a long time for the thermals to start developing. Many of the sniffers launched, and came back. We passed the time on the ground with umbrellas to keep the sun off. We were toward the middle of the pack. 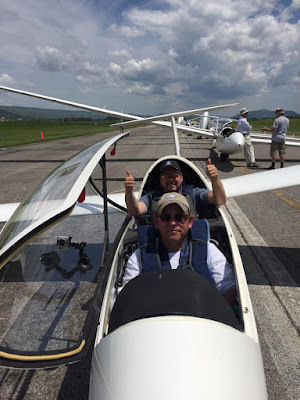 The standard class launched first, and Hank Nixon called back saying "These are really marginal soaring conditions" I made the mistake of sitting in the glider before it was actually our turn, and got sweaty for no reason at all. Thankfully, Evan left behind some beach umbrellas. "QQ was the envy of the fleet" with its colorful sunshades. Finally, we got to the skies, and I couldn't wait to go onto our course. We got a decent thermal in the start area, and once the class opened up, I was on my way. We headed northeast toward the first turnpoint, when the heat of the day turned into overcast, and no more thermals. Other gliders passed us underneath. I found one last thermal, and worked its mighty 0.5 knots until it gave no more. One of the nice things about having a two seater is that the person in front can look at all the fields, and I can consider, accept, or reject them. 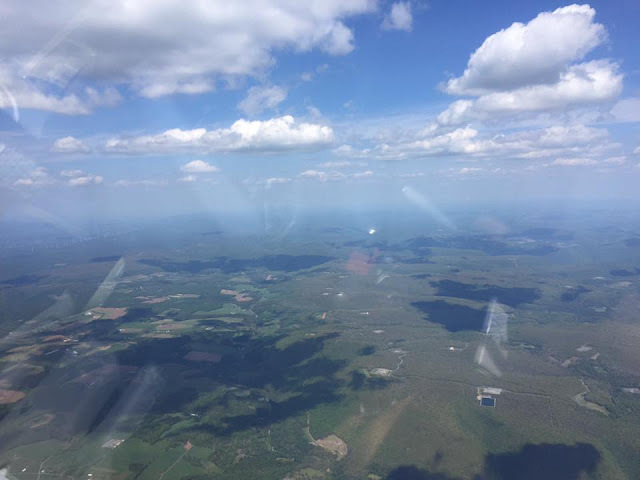 One of the nice things about soaring in this part of Pennsylvania, is that there are a LOT of landable fields, and the valley we were stuck in was no exception. Chris and I agreed to the top 3 fields that we liked. Some were rejected after closer inspection (hay bales), (wires), (fences), but there was one that looked utterly spectacular; bigger than the airport we usually fly out of. I watched Dave Weaver land in a field, and India Mike (Marty) land right next to him. We still had altitude to make it into the next valley to find one more thermal to get us back to Mifflin. I told Chris that we were going to cross this valley to that... cloud... way ... over there. If that cloud didn't work out, we'd be landing in that field that we agreed was the best option. That cloud, like all of the other clouds in this valley, gave no lift. I made the decision that it wasn't going to work out, and switched to "land-out-mode"
We flew a nice wide pattern around the field, getting as good a look at the field as we could muster. Google Earth view of the landing in the field. As we approached the field, a car was driving along the road. I would have liked to touch down in the first 20% of the field, but the approaching car was on a collision course if I just scraped over the road. I closed the brakes for a moment and made a high enough approach to clear the oncoming car. We made a perfect landing! 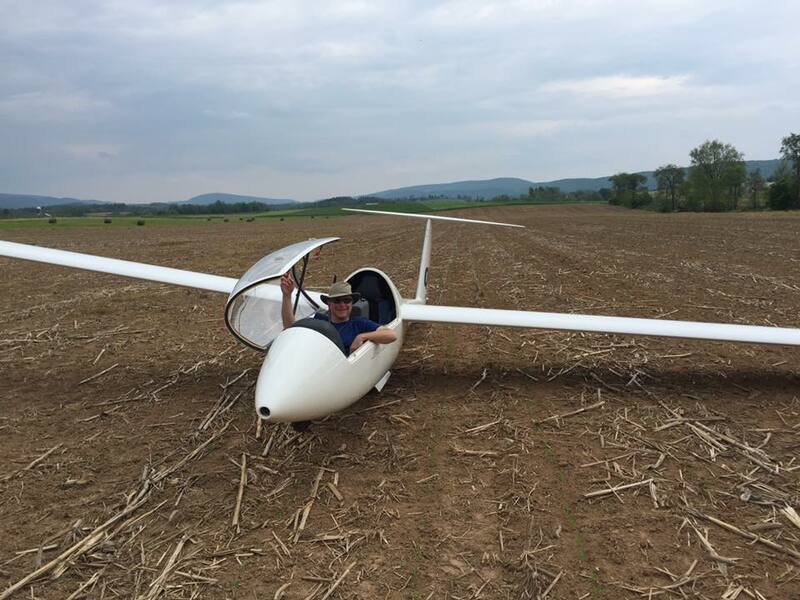 Chris is still in the glider after our off-field landing. I was pleased to see that the landing roll-out was short, and that I managed to miss all of the corn crop, which was not much more than "sprout" sized. I'd like to say that I planned it that way, but I guess it was just luck. Bill Bank had just arrived to Mifflin, and was quickly on his way to retrieve us. While we waited, the friendliest people came to see what this big white plane was doing in the field. Two young Amish men, Daniel and David approached us with a team of horses and a hay bailing machine. They asked the typical questions one would ask after seeing a glider for the first time. "Well, we have to get back to work!" "Hey, can I ask you guys a favor? Can you help us push this glider out of the corn field and on to the grass field where those hay bales are? " We pushed the Duo up a very slight incline, about 100 feet from where the horses were quietly munching on the hay bale they were about to load on to the cart and take back to the barn. We quickly realized that maybe the horses wouldn't like the site of this big white bird thing coming up the hill. One of them got freaked out, and the whole team of horses turned around and ran away, down the dirt path. David and Daniel ran after the galloping horses with a speed I've never seen before. David attempted to hop on board the hay bailer, and Daniel attempted to "head them off at the pass." I felt awful about this. They caught the horses, and brought them back. I apologized profusely, that a city boy wouldn't ever think of such a reaction from horses. The soaring was so terrible on Day 4 that my class had the day get cancelled. The points that I would have gotten for going out into the undiscovered country and landing out didn't count. I landed that glider in a field for nothing! I learned a valuable lesson: don't get into the glider until the sniffers have confirmed that the thermals were working. We all hung out in the shade of the Duo's wing until it was a sure thing that the lift was working. The soaring day was much better than I had expected. The task called for a Turn Area Task. With Bill Bank in the front seat, we set out. I just blurted out of the start cylinder on course, and got as high as I could. I spent most of the day streeting along, stopping to circle only when it was a really good thermal. We saw a glider struggling below near Beaver Creek. It was India Mike, the same guy who landed out on Day 4. "There's no way I'm getting that low"
I hate to downplay this flight, but it really was a matter of choosing nice looking clouds in the general direction of my task, flying to it, looking for lift, hanging out if it was good, leaving if it wasn't. Apparently, this was the best strategy of the day, because after Day 5, I was in second place in the Sports Class (after Karl Striedieck). Enough people had dropped out, withdrawn, landed out so many times, or scored so poorly that I could stay in the top three, as long as I didn't mess up too badly. With Chris Carswell in the front seat, I set out to fly a task that didn't have any serious mistakes. The conditions were much worse on Day 6 than on Day 5, but I managed to continue my "bop along cloud base" strategy most of the time. There were two different times that I really settled for some marginal 1 knot thermals when I needed to get on course, but at least I didn't land out. 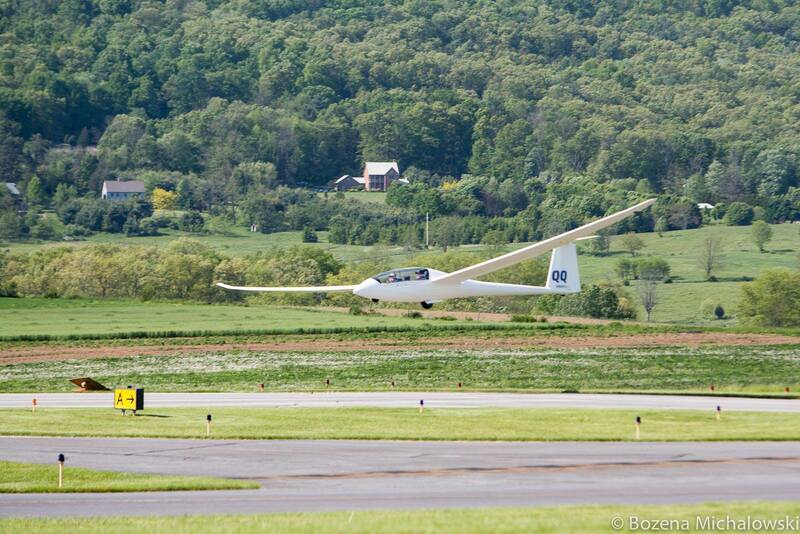 I was the last glider to land on the last contest day (but not the last to cross the finish line!). I didn't turn in my flight log in as quick a manner as the scorer wanted. He drove up to me and gave me an instructional moment, "I don't want to bust your chops since you're new around here..." Message received. I handed him my Nano, and he drove back to the club house to get the flight scored. I managed not to screw up too badly, and placed third in the Sports class, behind Karl Striedieck, and John Good. All three winners in the Sports class were flying Duo Discuses. 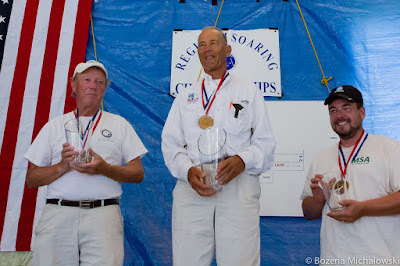 I honestly think that the only reason I got third place is because many of the really good pilots were flying as guests ( Mike Robison, Heinz W. ), and many dropped out or withdrew. I'll still take the trophy and place it on my glider trophy shelf, hopefully with many more to come in the future.